Learn the fundamentals of Arduino programing and design. 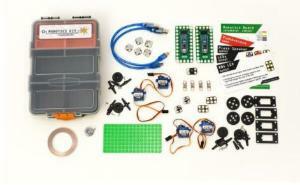 Create robots or interactive displays using the provided servo motors. The included Robotics Board allows for the easy addition of any sensor without the need for a breadboard or soldering. 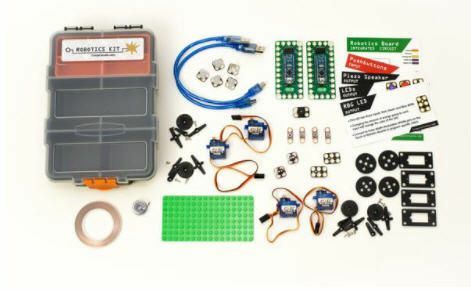 This kit covers topics such as circuitry, programing, logic, design, sewable technology, art, and design. Detailed directions, project guides, educational resources, and videos can be found in our online database. Ordering information: Includes Crazy Circuits Chips; Two Robotics Boards and USB Cables; Four Standard Pushbuttons; Five Jumbo 10 mm LEDs (Red, Amber, Green, Blue, White); Piezoelectric Speaker; Two Screw Terminals; Conductive Nylon Tape - 1/8 ", 16 feet; Two Standard Servo Motors; Two Continuous Rotation Servo Motors; Four LEGO™ Compatible Servo Brackets; Four LEGO™ Compatible Servo Horns; LEGO™ Baseplate (8 x16 studs); and Plastic Organizer.